Criss Sykes selected as 2018 District Teacher of the Year. 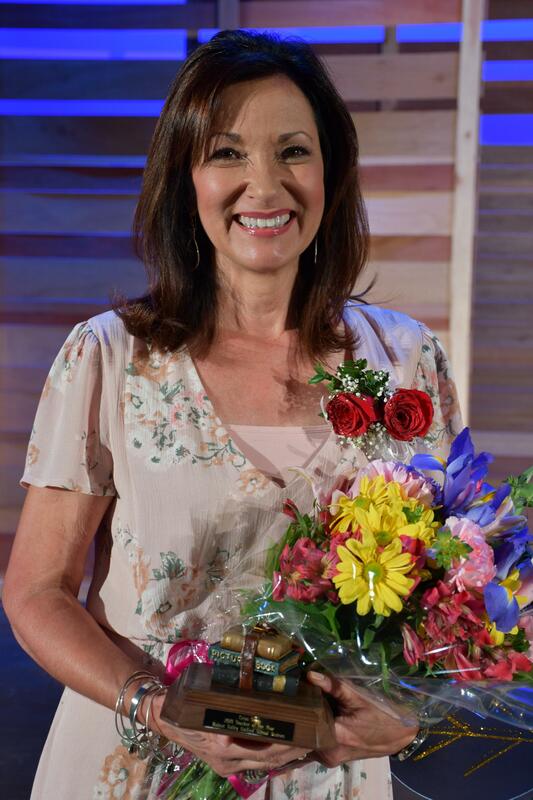 Click here to learn more and view Teacher of the Year photo album. 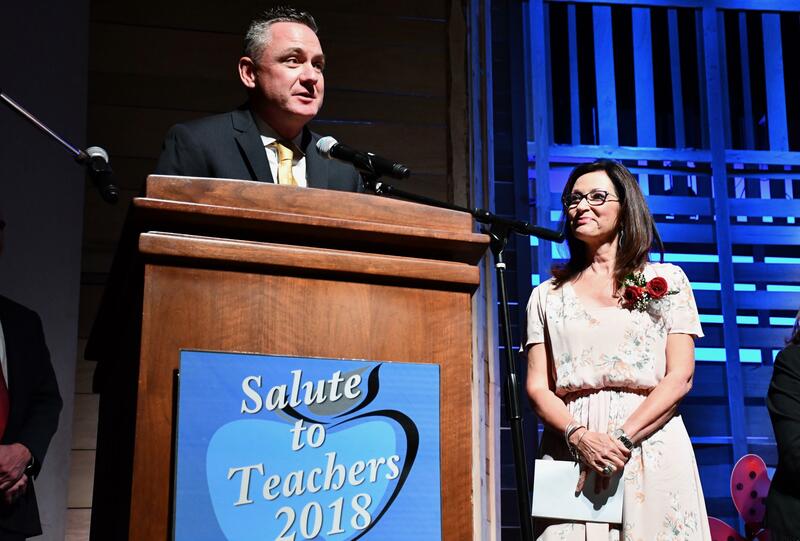 WALNUT, CA—Walnut Valley Unified School District paid tribute and thanked an extraordinary group of educators during the 21stannual Salute to Teachers on Wednesday. 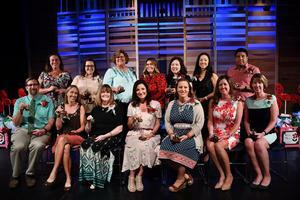 The 15 Teachers of the Year for 2017-2018 specialize in different subjects and grade levels, but share a passion for ensuring the best education for their students. 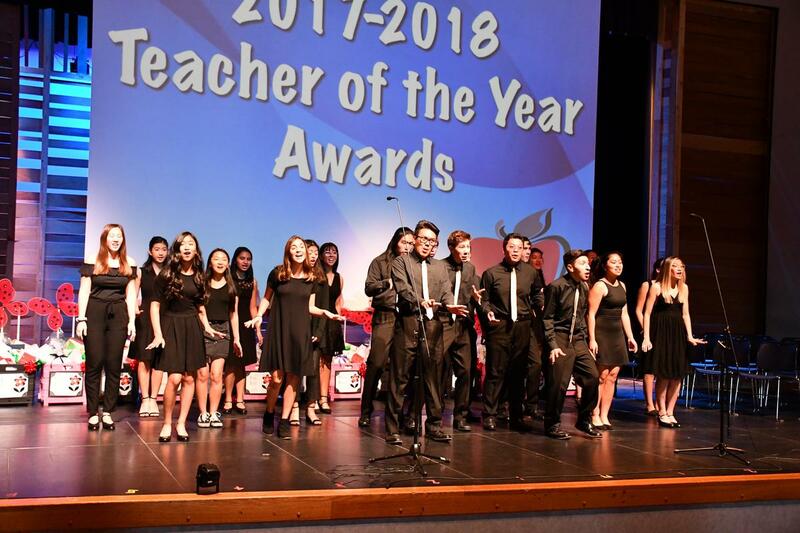 Over 300 educators, families, friends, and local officials gathered for the celebration of excellence held at the Walnut High School Performing Arts Center on October 17. 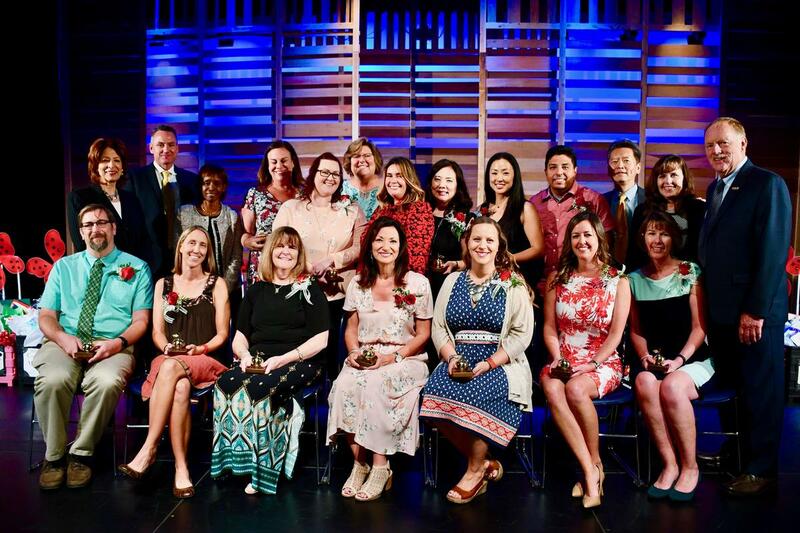 Congratulations to the following Teachers of the Year: Matthew Morrison – Castle Rock Elementary, Laura Ise – Chaparral Middle School, Carole Mead – C.J. 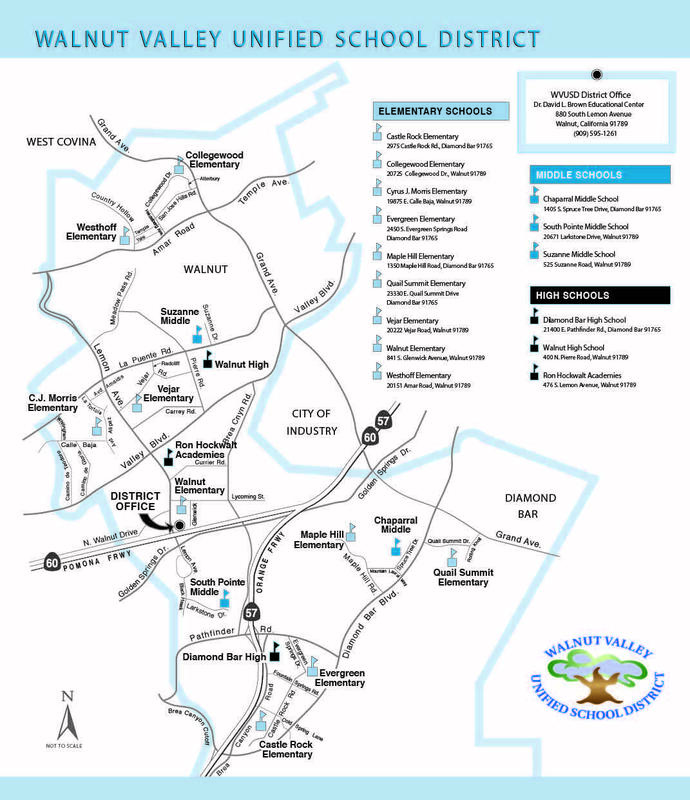 Morris Elementary, Lisa Holton – Collegewood Elementary, Julie Jeon – Evergreen Elementary, Johnny Hwang – Diamond Bar High, Meredith Cahalan-Casillas – Maple Hill Elementary, Criss Sykes – Quail Summit Elementary, Grace Lemos – Ron Hockwalt Academies, Kathryn Fujihara – South Pointe Middle School, Vicky Silcock – Suzanne Middle School, Brenda Moscoso – Vejar Elementary, Linda Kim – Walnut Elementary, Nicholas Madrid – Walnut High School, and Amy Leinen – Westhoff Elementary. 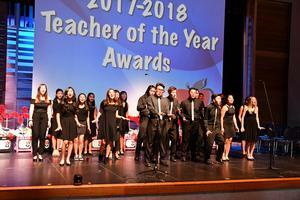 The recognition ceremony included personalized tributes, awards, and student entertainment by the Walnut High School Chamber Singers. Superintendent Dr. Robert Taylor commended the outstanding group of educators for the work they do to support students. “I can’t think of a more special group of people to recognize than teachers!” he said. 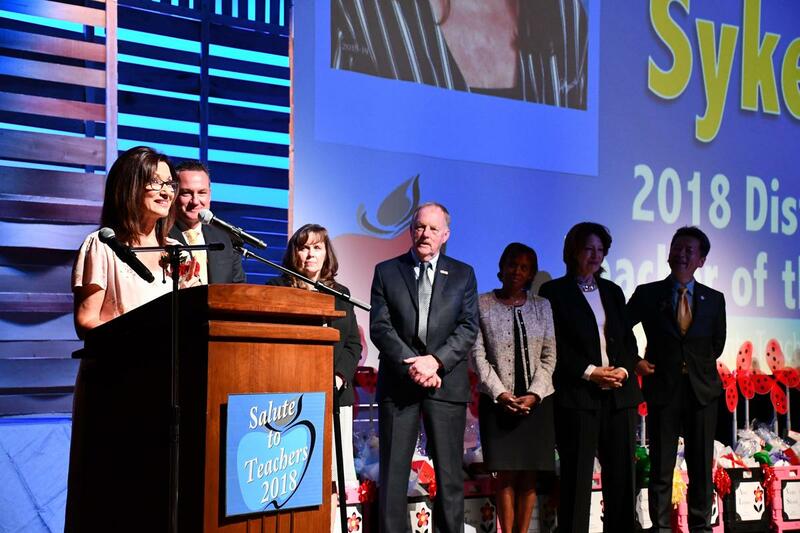 “And today, we get to recognize these 15 amazing individuals who serve our kids every single day,” said the schools chief who also thanked the more than 600 teachers in the District. 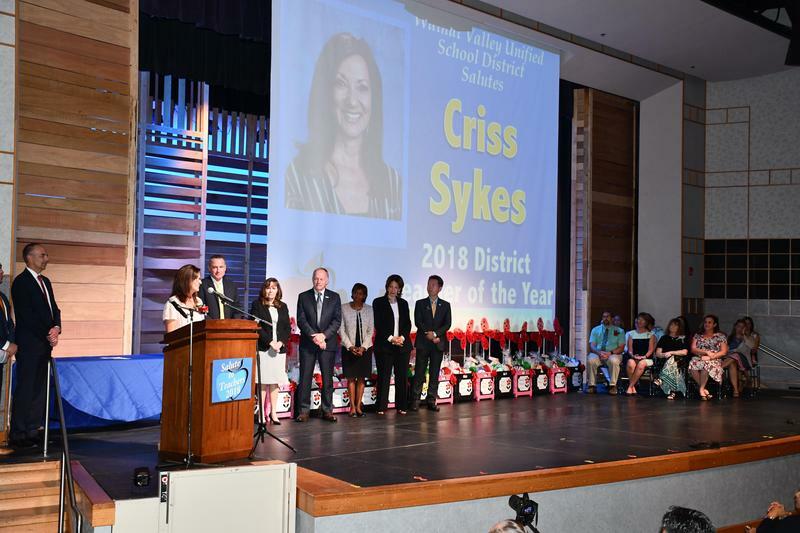 At the culmination of the program, Superintendent Dr. Taylor announced third grade teacher Criss Sykes as the 2018 District Teacher of the Year. Sykes also has the prestigious distinction of being named a Los Angeles County Teacher of the Year. She has taught in Walnut Valley for the past 16 years and is in her fifth year at Quail Summit. The District’s top teacher believes that relationship is fundamental to academic success and must be cultivated in every classroom. At 8:20, as students see their teacher coming, Taliah, Salote, or Alexander will lead: "Give me an M-R-S! Give me an S-Y-K-E-S! What's that spell? Ms. Sykes!" “To have an entire class greet me every morning with a cheer that they initiated months ago, brings more joy to my soul than I could ever explain. This tells me that they know we are a family. We are Team 13 and we are powered by relationship,” Sykes said. As students cross the classroom threshold, the teacher greets them by name, a comment or question, and always with a smile. “Making a connection is crucial to establishing a relationship. When you cultivate relationship and connectedness in your classroom, children and teachers thrive and grow. My cheer is for Team 13, and for every other educator who loves, pushes, and encourages students!” she added. ““We have incredible teachers at every grade level in Walnut Valley,” she continued. 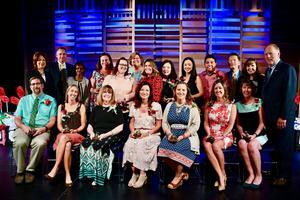 Each Teacher of the Year received a golden apple bell award courtesy of the Walnut Valley Educational Foundation. Honorees received rolling carts filled with gifts, school supplies, and certificates of achievement. A special thanks to the following Salute to Teachers sponsors: Massage Envy, Benihana Restaurant, Schools First Federal Credit Union, Chaffey Federal Credit Union, Illuminate Education, LifeTouch Photography, Chick-fil-A, Julie’s Café, Rubio’s, Nature’s Juice, and Jimmy Johns. Honoring Our Best! Walnut Valley USD honors the 2017-18 Teachers of the Year during the 21stannual Salute to Teachers. Shown with Board Members Board Members Larry Redinger, Cindy Ruiz, Layla Abou-Taleb, Dr. Tony Torng, Helen Hall, and Superintendent Dr. Robert Taylor. Ring the Bell! 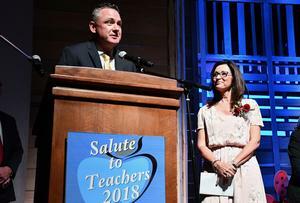 Walnut Valley USD pays tribute to the 2017-18 Teachers of the Year during Salute to Teachers held on October 17. Shown: Front Row: Matthew Morrison, Vicky Silcock, Carole Mead, Criss Sykes, Kathryn Fujihara, Amy Leinen, Laura Ise. Back Row:Lisa Holton, Meredith Cahalan-Casillas, Brenda Moscoso, Grace Lemos, Julie Jeon, Linda Kim, Nick Madrid. Walnut High’s Chamber Singers take the stage to perform “Under the Sea” during the Salute to Teachers on October 17. Superintendent Dr. Robert Taylor announces Criss Sykes as the 2018 District Teacher of the Year. Shown with Board Members Dr. Tony Torng, Cindy Ruiz, Larry Redinger, Helen Hall, and Layla Abou-Taleb. 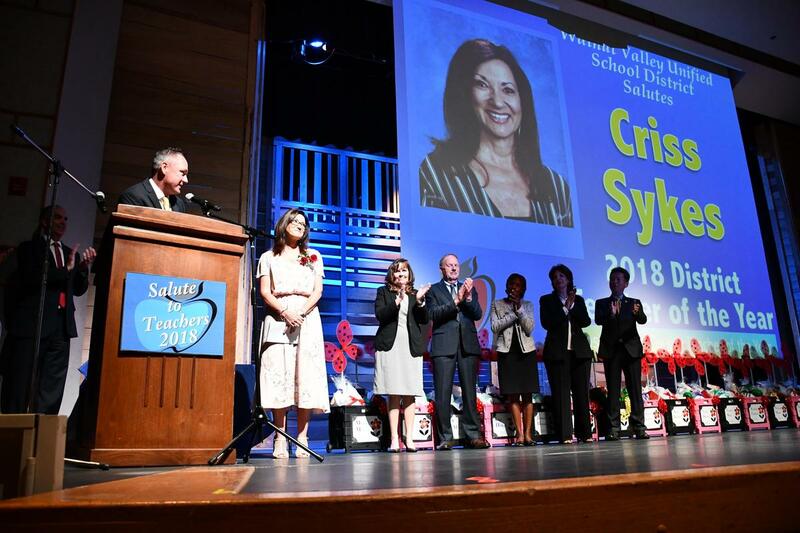 Criss Sykes from Quail Summit Elementary was announced as the 2018 District Teacher of the Year during Salute to Teachers on Oct. 17. 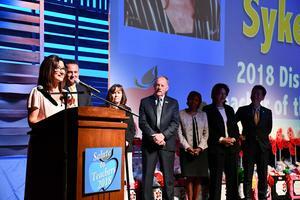 District Teacher of the Year Criss Sykes accepts top award during Salute to Teachers.